Citizen journalism, and citizen media overall, continue to grow. 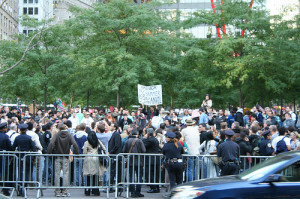 Most recently, Occupy Wall Street and related protests have been driving the momentum. More mainstream news outlets like Gawker and The New York Observer have found the topic a boon for Web-based journalism as well. For Columbia Journalism Review, contributor Alysia Santo highlights a myriad of developing citizen journalism projects, such as NowPublic, the largest participatory news network in the world with more than 85,000 contributors. Santo also points to Digital Journal, a site with 30,000 contributors from 200 countries who submit photos, videos, and articles, as well as Citizenside, a four-year-old site with roughly 70,000 members who upload photos and videos which is then sold to news outlets. One newly burgeoning citizen media site is n0tice, a project of The Guardian. The site is still in invite-only, private beta, but the U.K.-based newspaper recently opened n0tice to more users. It’s also opened up the capability for users to create their own “n0ticeboards,” which can be customized for appearance and content, and be assigned their own subdomain URLs. Contributors can post details about upcoming events, share news stories, or publicize items to sell. Image by Todd Blaisdell (BlaisOne), used under its Creative Commons license.